WTF / Cheese And Bacon Shampoo, Because You Want To Smell Cheesy and Greasy? Cheese And Bacon Shampoo, Because You Want To Smell Cheesy and Greasy? There’s no denying that cheese and bacon are two of the best foods in the world, but as someone who has worked in a restaurant at multiple times in my life, they aren’t something I’ve ever endeavored to smell like. Normally, you finish up a shift and go home where you can shower and wash the meat and cheese smell off. Silly me, according to Einstein Bros Bagels, I was doing it all wrong. They think we should be adding the cheese and bacon smell to our hair before we start our days. I feel bad for anyone stuck next to someone on the bus or train who has used this stuff. 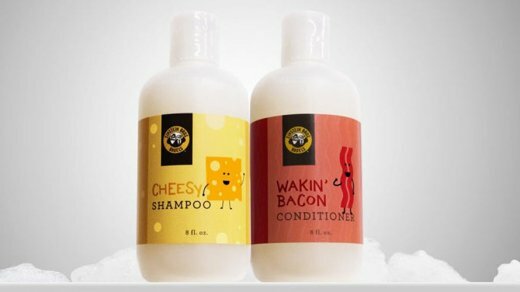 The cheese and bacon shampoo and conditioner set was available at einsteinbros.myshopify.com for $9.99, but the first batch has already sold out.